Although there is a great family resemblance between the wedding presents given to Royal personages, there are, nevertheless, distinctive features among them, suggested sometimes by the known tastes of the couple about to enter the holy bonds of matrimony, by the circumstances of the time, the nationality of the bride or bridegroom, and the fashions just then prevalent. These presents, too, have greatly increased in number of late years among all classes, as many of us know to our cost; and something depends on the time that has elapsed since the last similar occasion. When the Empress Frederick, the Princess Royal of England , was married in 1858, the idea was quite fresh to that generation, as no Royal wedding had taken place since that of her Majesty and the Prince Consort in 1840. There was a general feeling that she was "ower young to marry yet" . And the nation knew much less about Prince Frederick William of Prussia  than it has known of succeeding German princes. Still, Prussia was a power to reckon with, and it was evidently a good and prudent alliance. The young princess had not been very much before the public eye -- indeed, she had been busy with her education until recently -- and her personal presents from the English people were not numerous, though the offerings of plate and jewels from many German States made up a goodly total. Protestantism as founded on the Bible was then very prominent, and the princess was marrying into a pronouncedly Protestant family and nation, so the gift from 6,000 maidens of the United Kingdom of a large paper copy of Bagster's facsimile 8vo polyglot Bible, bound in purple morocco, and with clasps and corner-pieces of pure gold, engraved with the rose, shamrock, and thistle, was a very natural one. It was contained in a casket of English oak, richly carved and gilt. And a similar Bible has been given to each successive Royal bride. Among the jewels was a splendid suite, consisting of necklace, earrings, brooch, and bracelet in opals and diamonds from the Princess's father and brother, the Prince Consort giving the diamonds and the Prince of Wales  the opals. The King and Queen of Prussia , the bridegroom's uncle and aunt, sent her a beautiful diamond tiara. 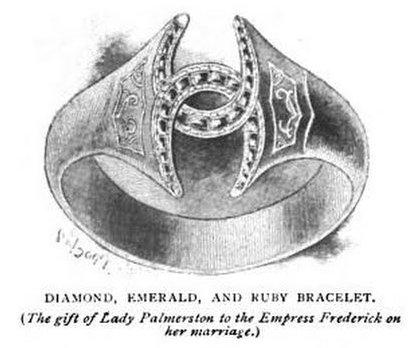 Presents that came with a note of intimate affection from English ladies were a diamond, emerald, and ruby bracelet formed of two entwined horseshoes from Viscountess Palmerston , and a horizontal watch set in a heart-shaped locket from the Marchioness of Ely , one of the best loved ladies in the Queen's household. The Duchess of Kent  was then alive, and she gave her granddaughter a huge ebony casket, mounted in silver gilt, and sumptuously fitted as a dressing-case and jewel-chest for her treasures. The brushes were ivory backed, and the combs tortoiseshell, and other items were silver-gilt, and set with coral. 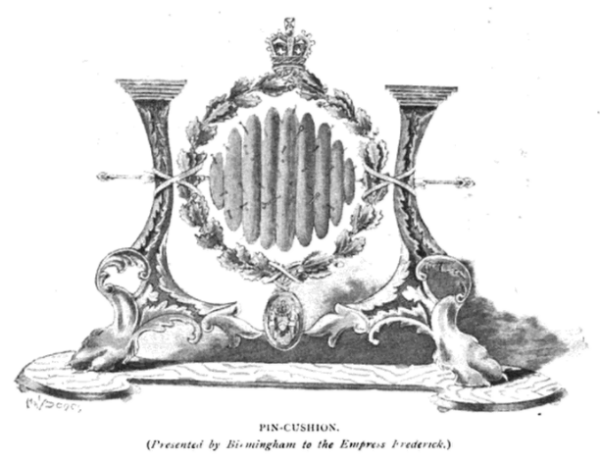 The burgesses of Birmingham evidently realised a woman's perpetual need of pins, for they sent the young princess a glorified green velvet pin-cushion trimmed with gold cord, and mounted on a gilt spindle that revolved in an elaborately carved frame of English oak, with a silver name-plate. It was much appreciated both at Windsor and in the Fatherland. The Maharajah Dhuleep Singh  always liked to give presents that were a little out of the common, and he sent the Princess Royal an exquisitely mounted opera-glass, engraved with the eagle and crown of Prussia. To the Princess of Wales  this potentate presented a very curious bouquet-holder of carved crystal, set with pearls and coral, as gems of the sea offered to the sea-king's daughter. On the stem was a band set with emeralds and diamonds, and a jewelled coronet, and the foot was a crystal ball set with rubies and diamonds. 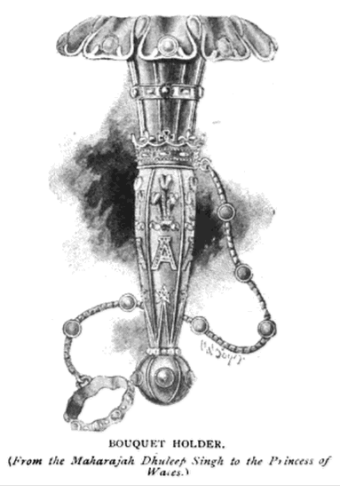 When this ball was turned the foot sprang open to form four supports, each adorned with a plume and a cypher, and attached to the holder was a gold and pearl chain with a hoop-ring of pearls attached to it. A smaller and altogether more private present was a beautiful little pair of silver and gold embroidered slippers, with a sprinkling of gems. And it was said that the young princess was so delighted when she saw them, that she declared she would be married in them. And she was. Another bouquet-holder received by the Danish princess was shaped like a cornucopia, with the rose of England in rubies, the thistle of Scotland in diamonds, and the harp of Erin in emeralds. This was from the Lady Mayoress of that year. The aged King of the Belgians, the Queen's "dear uncle Leopold" , sent the graceful girl, whose acquaintance he had made in his own family circle, her wedding dress, of the finest Brussels lace, with a scarf and handkerchief to match. It was unspeakably precious and costly. 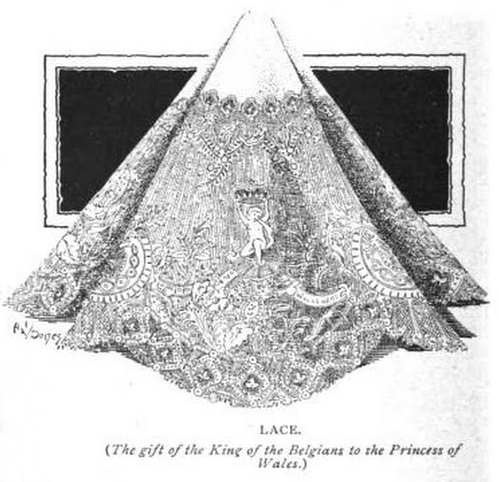 One other present of beautiful lace was received by the Princess of Wales on her marriage, and that was a point lace shawl and handkerchief of native work from the ladies of Ireland. Most of the Princess of Wales's jewels were wedding presents, but these were fully dealt with in a previous article. One of Princess Christian's  most characteristic wedding presents was from the Maharajah Dhuleep Singh, and consisted of a massive gold armlet set with diagonal lines of pearls and rubies, and with a centre ornament of white enamel, rubies and pearls, and which could be detached and worn as a brooch. The Queen and her brothers and sisters  gave her jewellery. Princess Louise , on her marriage to the present Duke of Argyll , received some very curious presents. The Queen gave her the usual set of opals and diamonds, and also a couple of emerald and brilliant centres for a bracelet or necklet. 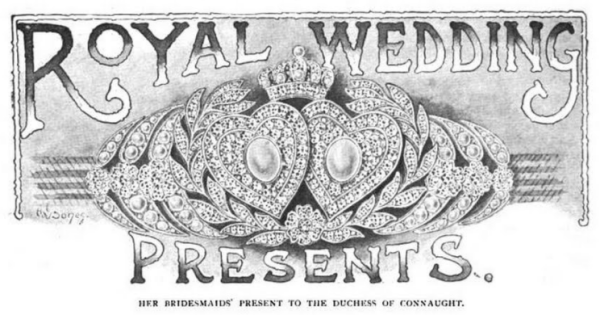 The bridegroom's parents gave an emerald and diamond tiara, and the Dowager Duchess  a jewelled brooch. Lady Beaconsfield  sent a very quaint emerald pendant. 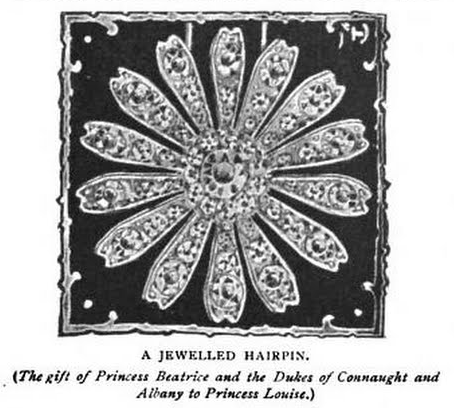 Princess Beatrice  joined with her brothers, the Princes Arthur  and Leopold , in giving their sister the prettiest of jewelled hairpins with a diamond daisy on the top. The Clan Campbell sent, as their lovely present to the bride of their future chief, a lovely diamond and pearl necklace, with a pearl locket and pendant bearing the galley of Lorne in sapphires. And a most curious bracelet of barbaric appearance came from the tenantry and peasants of the Ross of Mull, made of pieces of the peculiar green serpentine of Iona, mounted on a gold band. The Duchess of Connaught , being a German princess, the daughter of Prince Frederick Charles of Prussia, was little known in England, and received few presents outside the Royal family. The Emperor William  sent her four rows of most beautiful pearls; her bridesmaids gave her an elaborately handsome bracelet with two brilliant hearts, and one huge Oriental pearl as a centre, surmounted by a Royal coronet; and, in addition, a wreath of myrtle leaves in pearls and diamonds springing from a daisy, the bride's name being Louise Margaret. The town of Windsor gave a diamond bracelet with rosette centre. The Duke received some very handsome pieces of plate from his brothers-in-arms. The Duchess of Albany , whose home was the Chateau of Arolsen, in the small principality of Waldeck-Pyrmont, received a good many personal presents before coming to England to be married, and her sister, now Queen Dowager of Holland , gave her a remarkably rich, yet simple, wedding dress, made in Paris, regardless of expense. 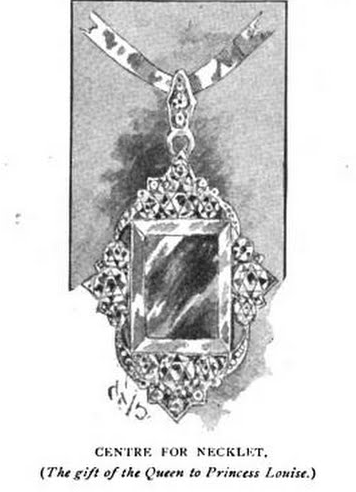 Prince Leopold's wedding gift to her was a diamond necklace and star. The Queen's household presented a jewelled bracelet, pendant, and earrings. And the town of Windsor offered a bracelet in the form of a thrice-coiled diamond serpent with a large sapphire head, and a half-hoop diamond ring. 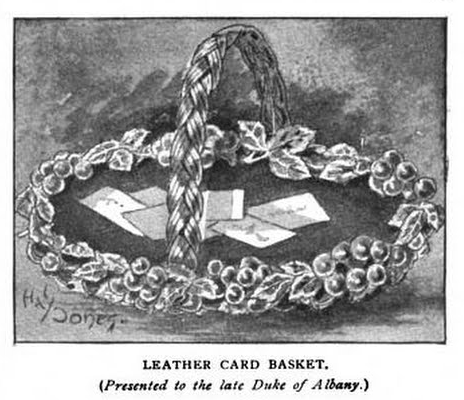 It was the Duke of Albany who received the quaint leather card basket sketched. It was made by Mr. F.A. Deer, of Neath, saddler to the Prince of Wales. 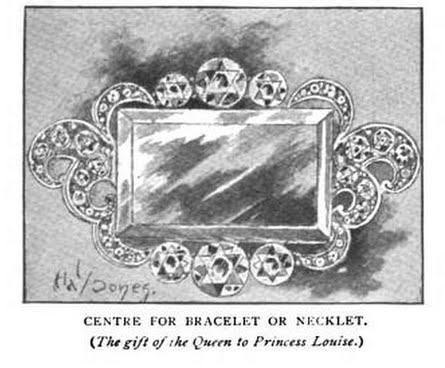 Princess Beatrice was the recipient of various pieces of handsome jewellery from members of her own family, and of a great many homely gifts of considerable value. No English princess has ever had so many books or small artistic presents. She has always taken a great deal of interest in artists living in the Isle of Wight, enrolled herself in their ranks, and sent her drawings to their exhibitions; and they sent her, as a wedding present, a white morocco-bound album containing a water-colour sketch from each. This, to quote the phrase of the day, she regarded as "distinctly precious." The town of Newport, Isle of Wight, gave her fifteen volumes of Shakespeare in a carved oak bookcase; and the women of all classes in Winchester, subscribing none less than a penny, and none more than five shillings, offered her a carved oak bookcase containing well-bound editions of all the standard English poets. From East Cowes she received four volumes of classical music. Less literary presents were: a splendid tapestry panel from the Royal Tapestry Works at Old Windsor; a wedding cake from the town of Liverpool; an elaborately carved oak linen-chest from the ladies of Bristol; and a wonderful embroidered quilt from those of Somersetshire. Two fans are worthy of notice, one of Honiton lace from the ladies of Sidmouth, and another from the ladies of Waterford, made by the girls in Miss Keane's school at Cappoquin, on the Blackwater. It is supposed that no English princess ever received such a quantity of jewellery as Princess Louise of Wales  on her marriage with the Duke of Fife , for its value was estimated at over 150,000 pounds. Among the most interesting items was the ruby horseshoe brooch given by her brothers and sisters, enclosed in a case bearing the names of "Eddie, Torie, Harrie, and George" . Then 112 of her girl friends gave her a diamond bracelet, and her masculine friends presented her with seven diamond stars. Diamonds came from all quarters, and other bijouterie galore; but it was said that the princess showed as much pleasure at Lady Hervey's present as at anything. It was a gold thimble set with diamonds, and showing a rose and thistle with the cipher of bride and bridegroom. The marriage of the Duke  and Duchess of York  was a great occasion, his Royal Highness being Heir-Presumptive to the throne, and a great deal of sympathy having gone out towards Princess May on account of her previous engagement to the Duke of Clarence , and his untimely death. It was observed that this time the Queen gave a tiara and necklace of diamonds only, omitting the opals. The ladies of England offered a diamond and pearl necklace and earrings, and 1,000 of her Majesty's subjects gave a lovely pearl necklace; while the girls of Great Britain and Ireland gave a superb diamond and pearl tiara. It almost seemed as if every body of women or officials who could give themselves a name vied with one another in presenting jewels. The Rajah of Kapurthala  sent a diamond cluster stomacher, and the Rani of Gondal  a Louis Seize diamond necklace. Among the unusual presents was a sleigh with silver bells, harness, and fur robes complete from the women of Canada. An ostrich feather fan, with the word "May" in diamonds on a scroll, was sent from South African colonists. The miners of Leadville forwarded a gold motto ring. The Empress Eugenie  gave a jewelled peacock feather brooch, and Queen Isabella of Spain  another; and a "few women of the stage" a diamond rose spray. Of special interest was an oak table and box, containing lace made by an old woman of eighty, which came from the vicar and parishioners of Sulgrave. Princess Maud's  wedding with Prince Charles of Denmark  was so recent that the details are still fresh in many minds. The Queen gave her a diamond and ruby collet necklace, and the Prince and Princess of Wales a diamond and pearl tiara. Many public bodies presented handsome jewellery, and the wedding ring itself was the gift of the Gorsedd and National Eisteddfod Association, and was of pure Welsh gold from the Trawsfynydd mines, enclosed in a silver casket. A case of silver toast racks was the present of thirty-three young ladies named Maud. A Japanese silver and enamel tea service was the offering of members of the Geisha company of Daly's theatre, and a folding papeterie table was from Mrs. Beerbohm Tree . 1. Empress Frederick of Germany (1840-1901), née Princess Victoria, Princess Royal, was the eldest child of Queen Victoria and Prince Albert. She married Prince Frederick William of Prussia in 1858; we discussed their wedding in this post. 2. This is a reference to "I'm O'er Young To Marry Yet" by Robert Burns. 3. Emperor Frederick III of Germany (1831-1888), son-in-law of Queen Victoria and Prince Albert, had a very brief reign; he was already suffering from cancer when he inherited the throne in March 1888, and he died the same June. He was succeeded by his son, Wilhelm II. 4. The Prince of Wales (1841-1910), later King Edward VII of the United Kingdom, succeeded to the British throne less than a year after this article was published. He reigned until his death in 1910. 5. King Frederick William IV (1795-1861) and Queen Elisabeth (1801-1873) of Prussia were the uncle and aunt of Prince Frederick William, the Princess Royal's husband. Elisabeth caused controversy in the family when she chose to bequeath her jewels to Vicky (her niece-in-law) rather than her sister-in-law, Augusta. 6. Emily Temple, Viscountess Palmerston (1787-1869) was the sister of one prime minister (Queen Victoria's confidant, Lord Melbourne) and wife of another (Lord Palmerston). 7. Jane Loftus, Marchioness of Ely (1821-1890) was one of Queen Victoria's Ladies of the Bedchamber and one of Victoria's closest and most trusted friends. 8. Princess Victoria, Duchess of Kent (1786-1861), née Princess Viktoria of Saxe-Coburg-Saalfeld, was Queen Victoria's mother (and Prince Albert's aunt). 9. Maharaja Duleep Singh (1838-1893) was the last ruler of the Sikh Empire. He spent his entire adult life in exile in Britain and had a complicated relationship with Queen Victoria and the British royal family. 10. The Princess of Wales (1844-1925), née Princess Alexandra of Denmark, became Queen Alexandra of the United Kingdom in 1901. She was the wife of King Edward VII of the United Kingdom and the mother of King George V of the United Kingdom and Queen Maud of Norway. 11. King Leopold I of Belgium (1790-1865) was the first monarch of independent Belgium, reigning from 1831-1865. His first wife was Princess Charlotte of Wales, the heir to the British throne, who died in 1817. He was an uncle to both Queen Victoria and Prince Albert. 12. Princess Christian of Schleswig-Holstein (1846-1923), née Princess Helena of the United Kingdom, was the fifth child of Queen Victoria and Prince Albert. She married Prince Christian of Schleswig-Holstein in 1866; we discussed their wedding in this post. 13. Helena's brothers and sisters were: Victoria (Empress Frederick of Germany), Bertie (King Edward VII), Alice (Grand Duchess of Hesse), Alfred (Duke of Edinburgh and Saxe-Coburg and Gotha), Louise (Duchess of Argyll), Arthur (Duke of Connaught), Leopold (Duke of Albany), and Beatrice (Princess Henry of Battenberg). 14. Princess Louise, Duchess of Argyll (1848-1939), née Princess Louise of the United Kingdom, was the sixth child of Queen Victoria and Prince Albert. She married John Campbell, Marquess of Lorne (later Duke of Argyll) in 1871. 15. John Campbell, 9th Duke of Argyll (1845-1914) was the son-in-law of Queen Victoria through his marriage to Princess Louise in 1871. He later served as Governor-General of Canada. 16. Anne, Duchess of Argyll (d. 1874), née Anne Cuninghame, was the third wife of the 7th Duke of Argyll and the stepmother of the 8th Duke. 17. Mary Anne Disraeli, Viscountess Beaconsfield (1792-1872) was the wife of Prime Minister Benjamin Disraeli. Queen Victoria offered her husband the Beaconsfield viscountcy, but he refused, because he wanted to remain in the House of Commons; Mary Anne accepted it in his place, becoming Viscountess Beaconsfield in her own right in 1868. After Mary Anne's death, Disraeli was eventually created Earl of Beaconsfield. 18. Princess Henry of Battenberg (1857-1944), née Princess Beatrice of the United Kingdom, was the ninth and youngest child of Queen Victoria and Prince Albert. She married Prince Henry of Battenberg in 1885. 19. Prince Arthur, Duke of Connaught (1850-1942) was the seventh child of Queen Victoria and Prince Albert. He married Princess Louise Margaret of Prussia in 1879; one of their daughters became Crown Princess Margareta of Sweden. He also served as Governor-General of Canada. 20. Prince Leopold, Duke of Albany (1853-1884) was the eighth child of Queen Victoria and Prince Albert. He married Princess Helena of Waldeck-Pyrmont in 1882. His hemophilia contributed to his early death. Leopold was the great-grandfather of King Carl XVI Gustaf of Sweden. 21. Princess Louise Margaret, Duchess of Connaught (1860-1917), née Princess Louise Margaret of Prussia, was the fourth child of Prince Frederick Charles of Prussia (a nephew of Emperor Wilhelm I) and Princess Maria Anna of Anhalt. She married the Duke of Connaught in 1879. 22. Emperor Wilhelm I of Germany (1797-1888), the first head of state of united Germany, was the father of the Princess Royal's husband, Emperor Frederick III, and a cousin of the Duchess of Connaught. Queen Victoria of Sweden was his granddaughter. 23. Princess Helena, Duchess of Albany (1861-1922), née Princess Helena of Waldeck-Pyrmont, married Queen Victoria's youngest son, Prince Leopold, in 1882. Their marriage was brief; Leopold died suddenly before the birth of their second child. Two of her sisters married kings: Marie married King William II of Wuerttemberg, and Emma married King Willem III of the Netherlands. 24. Queen Emma of the Netherlands (1858-1934), née Princess Emma of Waldeck-Pyrmont, was a sister of the Duchess of Albany. In 1879, she became the second wife of the elderly King Willem III of the Netherlands. Their only child, Wilhelmina, became Queen of the Netherlands in 1890. Emma served as regent for her daughter until 1898. 25. Princess Louise, Princess Royal and Duchess of Fife (1867-1931) née Princess Louise of Wales, was the eldest daughter of King Edward VII and Queen Alexandra of the United Kingdom. She married Alexander Duff, 1st Duke of Fife in 1889. 26. Alexander Duff, 1st Duke of Fife (1849-1912) was the husband of Princess Louise, Princess Royal and Duchess of Fife. Queen Victoria elevated him from Earl of Fife to Duke of Fife two days after his wedding to Louise in 1889. He died in Egypt after the family was shipwrecked; read about the jewels possibly lost in that tragedy over here. 27. "Eddie, Torie, Harrie, and George" were the names/nicknames of Louise's siblings: Prince Albert Victor, Duke of Clarence ("Eddie"), Princess Victoria ("Torie/Toria"), Princess Maud ("Harrie," later Queen of Norway), and Prince George, Duke of York (later King George V of the United Kingdom). 28. Prince George, Duke of York (1865-1936), later King George V of the United Kingdom, was the second son of King Edward VII and Queen Alexandra of the United Kingdom. He married Princess Mary of Teck in 1893; their granddaughter, Queen Elizabeth II, currently sits on the British throne. 29. Princess Mary, Duchess of York (1867-1953), née Princess Mary of Teck, became Queen Mary of the United Kingdom when her husband, King George V, ascended to the throne in 1910. Two of her sons, King Edward VIII and King George VI, also became monarchs. 30. Prince Albert Victor, Duke of Clarence and Avondale (1864-1892) was the eldest son of King Edward VII and Queen Alexandra of the United Kingdom. He was engaged to Princess May of Teck when he died of influenza and pneumonia in 1892; she later married his younger brother, George. 31. Sir Jagatjit Singh Bahadur, Raja of Kapurthala (1872-1949) was ruler of the Indian state of Kapurthala from 1877 until his death in 1949. 32. Maharani Shri Nand Kunverbaiji Sahiba (1867-1936) was the wife of Bhagvatsingh Sahib, the Maharaja of Gondal from 1869-1944. 33. Empress Eugenie of France (1826-1920), née Eugenie de Montijo, was the wife of Emperor Napoleon III of France. After he was deposed in 1871, Eugenie spent much of the rest of her life in exile in England, where she became close with the British royal family. 34. Queen Isabella II of Spain (1830-1904) was the country's queen from 1833 until 1868. Her son, King Alfonso XII, eventually succeeded her. Her grandson, King Alfonso XIII, married a British princess, Ena of Battenberg. 35. Princess Charles of Denmark (1869-1938), née Princess Maud of Wales, later Queen Maud of Norway, was the youngest daughter of King Edward VII and Queen Alexandra of the United Kingdom. Her grandson, King Harald V, currently occupies the Norwegian throne. 36. Prince Charles of Denmark (1872-1957), son of King Frederik VIII and Queen Louise of Denmark, married Princess Maud of Wales in 1896. Nine years later, he was elected King of Norway, and he changed his name to Haakon VII. He reigned as Norway's king from 1905 until his death in 1957. 37. Helen Maud Holt (1863-1937) was a celebrated Victorian actress and the wife of the equally-celebrated actor Sir Herbert Beerbohm Tree.